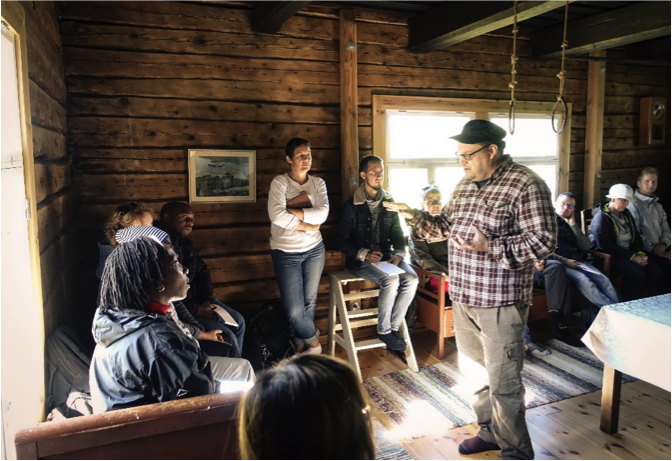 Students, researchers and practicing professionals from 18 different countries gathered at the University of Eastern Finland in Joensuu, August 2018, for the third NOVA PhD course on Environmental Collaboration and Conflict Resolution. The action-packed week, led by Irmeli Mustalahti and Antti Erkkilä (University of Eastern Finland), with the help of the invited key expert Mara Hernández (CIDE, Mexico), was filled with lectures and practice-driven exercises. The course was organized in collaboration with the University of Eastern Finland, the University of Copenhagen, the University of Agder, the Norwegian University of Life Sciences, and ALL-YOUTH and CORE research projects. 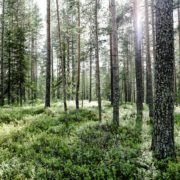 Funding was provided by the Nordic Forestry, Veterinary and Agricultural University Network (NOVA) and the Strategic Research Council at the Academy of Finland (SRC). On the first day, we began the course by discussing the various reasons for conflicts related to natural resources. Utilizing the participants’ long list of real life cases, Irmeli Mustalahti illustrated well how hard it is to classify them under one-dimensional categories. We noted quickly that most of the conflicts had more to do with humans than natural resources. Indeed, behind many environmental problems there are social challenges that need to be addressed. While it is not easy, one way to categorize conflicts is according to their causes. On the one hand, they can be caused by conflicting interests, information or relationships, which are generally issues that can be negotiated and solved. On the other hand, there can be issues related to values, power and social structures, which may be difficult or almost impossible to solve. Environmental conflicts can also include factors from all the above categories which make them incredibly complex. Moreover, conflicts are not always a bad thing. They can even be seen as necessary and inevitable, bringing light to injustice or other problems, which may eventually lead to a better situation. They can provide an opportunity for reform and triggering coalition building for positive change. Conflicts have a role to play, but the prevention of violence should always be the priority. During the week, we were asked to think about our own conflict cases through the concepts of dividers and connectors. Dividers are factors that divide the communities or the stakeholders in the case. On the contrary, connectors are factors that can bind the stakeholders together. Both of these can be systems and institutions, attitudes and behaviors, values and interests, and so on. To understand the real dividers and connectors, which may be hiding behind the positions, a stakeholder analysis has a vital role in the beginning of any kind of conflict resolution process. The historical context of the society or the local community usually reveals the different and sometimes numerous causes that have triggered the current conflict. On the second day, we did an exercise which simulated a negotiation between an imaginary energy company and a First Nations band. In our group the negotiation went excellently, and we achieved a mutually beneficial agreement in the end. After listening to other groups’ experiences (negative and positive), I think there were several factors that allowed us to accomplish this. In the first meeting just among the company (or the band), we had established clear common goals that we would try to achieve. We also discussed issues that could and could not be negotiated and what would be the ultimate limits for us. This made the actual negotiations easier for us – we were clearly on the same page all the time. Second, the parties understood what their priorities were and what the issues were where they had leeway to give in. Neither party was expecting to get everything listed in the papers – we had a certain level of flexibility. Third, we had well matching personalities within the group. I personally think the role of individuals and personalities is underemphasized in the literature, while in real life it plays a critical role. Asking any experienced mediator, they will tell it can make or break the process. Fourth, everyone in the group did great job at listening to the others. Listening to the other groups’ experiences afterwards, this did not seem to be the case for all. 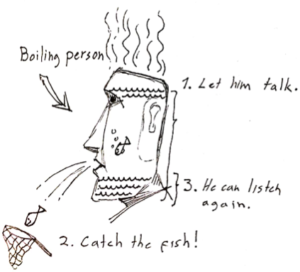 Mara Hernández elaborated well how people are unable to listen when they are emotionally fuming. The feeling of not being heard is extremely frustrating and it blocks your ability to process any new information. One way around this is utilizing facilitation methods that ensure people feel heard, which makes them more willing to cooperate again in a more relaxed state. In fact, these methods were used in the Jyväskylä Consensus Building Process which Emma Luoma from Akordi presented in the afternoon (learn more from Luoma, 2018). Akordi is a consult company which specializes in consensus building and collaborative approaches in cases that usually involve reconciliation of multiple interests. In the discussion after the presentation, there were comments that touched on the practical aspect of this process. As Emma also noted, it included several sessions and was quite time consuming for some of the parties. However, as there is almost no experience of these processes in Finland, it could be argued that with increased capacity, the process could move faster. Nevertheless, it is a valid question: how often is it viable to use this kind of comprehensive approach? Perhaps it must be thought how important the case in question is. If a solution is crucial, there are no shortcuts for consensus. Building relationships, trust and common understanding takes time. The intense week was split by an excursion to the nearby lake Koitere in Ilomantsi. The class was divided into four groups who were on a “fact-finding mission” with topics related to conflict of interests in land use. The cases had also some kind of local context and part of the exercise was to gather information from the local representatives in addition to the experts. Our group’s topic was “multi-purpose forest and overlapping interest”. Our information package called us to question the role of Everyman’s Right in the current situation, where some think it has been abused for commercial activities. It can be argued that this was never the intended purpose of this common law and the topic has sparked discussions about restrictions and land-owners’ right for benefits. Our group was led to the forest where the assigned expert Hilkka Heinonen (University of Eastern Finland) began telling us about Everyman’s Right and how it has been used in Finland by the entrepreneurs who bring large groups of foreign berry pickers for the season. The dynamic on the spot was that Hilkka, the expert, was telling us about the issue in English while everyone gathered around her. Raija, our local informant, stood on the side and telling from her body language (slightly withdrawn posture, hands behind the back, partly behind tree trunk) was a bit timid about the situation. Few moments later, more experts arrived to the scene and part of the group split to discuss with them. This looked like too much of a classical book example where the locals are forgotten to the side while the “experts” take the center stage (later we learned this had been planned by the organizers). To make the most out of it, we formed another smaller group around Raija, where I felt like we could ask questions in a more intimate atmosphere. It was also noticeable that the language barrier had been somewhat hindering the discussion earlier. She was now elaborating her answers more without the need of translation. The language and the discussion setting matter. The next observation I wrote down was the impact of the pre-reading material on the discussion and especially on our expectations about the situation. As the topic had been framed as a conflict, we though that there must have been also a local conflict related to the Everyman’s Right. However, as we continued asking questions about any possible issues, it became apparent that Raija did not feel like there were any in the area (from her point of view at least). At one point, I felt like we were almost trying to invent a conflict to satisfy our expectations. The mentioned commercial berry picking was not happening in the area, the big predators were not a problem to her and she did not even have a problem with the forestry activities. On the contrary, judging from her answers, it felt like Everyman’s Right had a more of a binding force to the local community here. At the end of the day, we reflected the exercise within our group. It was interesting to see how we all focused on different issues. Since much of the English discussion revolved around the berry picking issue, this framed the whole issue for the group. To mention few perspectives: one person was thinking about the possible conflict between different entrepreneurs; second thought that the law is being abused and third thought there is absolutely no issue with commercial berry picking and it should be increased. While the big group size had caused some issues at the initial interviewing situation, it resulted in many different perspectives about the topic. On Thursday, we had another exercise: six-party, multi-stakeholder simulation with a facilitator. This turned out to be much more difficult setting to achieve an agreement compared to the previous situations. Indeed, our group failed to get a proper result, even though in the end, we made some progress. Reflecting on the exercise afterwards, I believe the biggest reason hindering our group was the lack of understanding of the details about the issue we were negotiating about. Most of the time was consumed by questions and clarifications as it was uncertain if the parties were even discussing about the same details. This illustrates well how lack of preparation is one of the major reasons why negotiations end up in a failure. The second reason was the facilitator’s attempt to move on the negotiated conditions in order, one by one, instead of thinking them as packages. Package approach increases the chances of win-win outcomes and may help to avoid situations where that one item that cannot be resolved blocks the whole process. Indeed, almost no one was willing to give up on any of their demands, causing the negotiations to get stuck in a deadlock. Furthermore, people failed to highlight their priorities and the conditions that were not on top of their agenda. Third, the difference between winning and being a winner was well illustrated in the exercise. The “winner” mentality emphasizes the approach where the goal is to gain as much as possible while others gain very little. This approach often ends in a situation where the total pot of benefits remains very small. 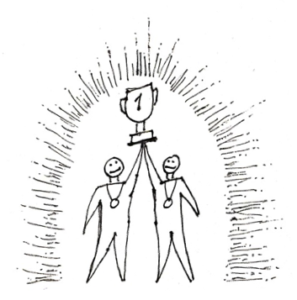 With the “winning” approach, you are looking for mutual benefits that can be accomplished together. For this to be possible, recognizing which interests are distributive and which ones are integrative is essential. Finally, in all the exercises it was fascinating to see how the emotions of people can really take over even in this kind of imaginary situations. In some way, people can play their roles even too strongly and achieving a good result may be more difficult than in real life, as Mara Hernández noted. Negotiating without real stakes can be like playing poker with match sticks: people behave differently. In the final day we discussed research ethics and the role of a researcher in a conflict. In the CORE project, we are often conducting action research as a neutral expert in sensitive case contexts. Our work has real consequences and failing to consider the ethical aspects can cause real harm. Questions such as, who benefits from our work and how do we define success, are present in all our cases. I would like to also highlight the idea from Mara’s and Irmeli’s final lectures that in very difficult conflicts, the aim of the mediation process does not have to be a perfect agreement. It may be more realistic and enough to make progress in just one of the following three aspects: substance, procedure or relations. In certain situations that can be a big win already. In every conflict situation, the skills of the professionals play a key role in choosing the right model of strategy for the case. In the context of strategy, the role of a neutral outsider as the facilitator is an issue that is not well acknowledged in Finland. The state or the local governments often try to facilitate their conflict situations themselves, even though it is clear they are not seen as a neutral party by everyone. For example, the municipality may have an interest in attracting the big investments or businesses for the tax money, but at the same time, other sectors affected by these plans may completely oppose them. Even if the governmental staff working on the case is sincerely neutral, the perceptions of bias or corruption may remain. To make it more complicated, sometimes it may be difficult to sell the idea of utilizing a third-party to solve a conflict situation, as the authorities may feel like they are admitting their failure in doing so. However, you can look at the issue with a much more positive and realistic lens. Whoever the actor in question, the state, municipality, city, is being very progressive and innovative by utilizing new collaborative approaches to find a sustainable solution. Framing the case in a right manner goes a long way. In the final reflections about the course, the participants mentioned many of the issues I have highlighted in this blog. However, to be able to take on multifaceted environmental conflicts, you need more than just a list of lessons. In this relatively narrow field, networks and contacts should be cherished as we are constantly building on the experiences of others. Finally, it is clear that the attractiveness of collaborative methods is only going to be growing in the future. Increasingly complex, more challenging and global environmental problems combined with the changing role of the state and civil society will only increase the pressure for more holistic and collaborative approaches. Juha Kotilainen is a researcher at the University of Eastern Finland Department of Geographical and Historical Studies. He works in the CORE project team focusing on mechanisms and capacities of collaborative governance. UEF news story about the course, August 2018. How to win together. Blog by course participant Emma Luoma September 3, 2018. Luoma, E. (2018). Intressien yhteensovittaminen monenvälisenä neuvotteluprosessina: tarkastelussa Jyväskylän strateginen metsäohjelma. Master’s thesis. University of Tampere.